The Latino community in the Greater Salt Lake area often struggles to provide nutritious food for their families. Communities United/Comunidades Unidas (CU) implemented a program, Starting Well/Comenzando Bien, to help address some of these challenges. Many parents expressed "their frustration in not knowing where to find or how to select better quality food that was still within their budgets," explained Rose Maizer, Development Director of Communities United. With funding from the Office of Disease Prevention and Health Promotion (ODPHP), Communities United/Comunidades Unidas (CU) was able to expand their programming to address nutrition, body weight, and maternal and child health with a focus on pregnant women ages 18 to 40. According to the U.S. Census, the Hispanic population in Utah now comprises 12.3% of the population with a significant portion of the Hispanic population living in poverty or without health insurance. CU's Starting Well/Comenzando Bien program is helping reduce preventable health disparities in the Greater Salt Lake area. As part of Starting Well/Comenzando Bien, Ms. Maizer and her colleagues at CU developed culturally and linguistically appropriate nutrition and weight management resources for Latina women in their community. Another component of the Starting Well/Comenzando Bien program consists of 4-week long classes at CU. The curriculum is "designed for pregnant women in a supportive group setting to learn about having a healthy pregnancy and a healthy baby," described Luis Garza, Executive Director of Comunidades Unidas. CU addressed nine different topics in the 4-week long curriculum including information on how to have a healthy pregnancy, the importance of prenatal care, and stress during pregnancy. Between January 2012 and August 2012, 64 women graduated from the 4-week long classes at CU. In addition, 575 women received prenatal nutrition and weight- tracking information and tools through events and other outreach activities. One of the goals of Starting Well/Comenzando Bien was “to give new mothers the tools they need to make long-term changes to diet and lifestyle that will benefit themselves and their families post-pregnancy,” explained Ms. Maizer. In order to help mothers make long-term changes in their diet and lifestyle, CU needed to support the women in creative ways. 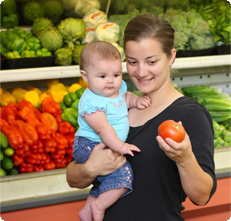 This included joining a dance group or "creating a graphic of all their favorite healthy foods so that their family knows what they like to eat," explained Yehemy Zavala, Prenatal Program Coordinator at CU. The second strategy of creating graphics of favorite foods was particularly relevant, as many parents "said it was often difficult at grocery stores to differentiate between foods that were bad for their children (e.g., foods high in saturated fat) and those that were healthy," said Ms. Zavala. Ms. Maizer and her colleagues at CU understood the importance of building relationships with program participants to create a safe space to address health issues. "A lot of the issues that they discuss are very personal and sensitive," expressed Ms. Zavala. CU provided a welcoming space to participants in the program. One important lesson Ms. Maizer and CU learned was the difficulty in evaluating the long-term results of Starting Well/Comenzando Bien. In order to determine the long-term results, CU staff is "keeping in touch with their participants to track progress," continued Ms. Maizer, as "time is really important because you cannot expect changes to be made overnight." As the Latino population in Utah continues to grow, CU is ready to continue to offer support and services to help reduce health disparities. The mission of Communities United is to eliminate ethnic disparities by promoting grassroots outreach, education, and capacity building, as well as advocating for long term policy change.